We’ve talked before about automation on Facebook, and on social media in general. I’ve always cautioned against using too much automation, but some basic level is almost required for the proper management of an active page. There are just so many things going on all the time that it’s hard to justify doing everything by hand. You need to keep the personal touch, of course, but you can still do that with careful automation. 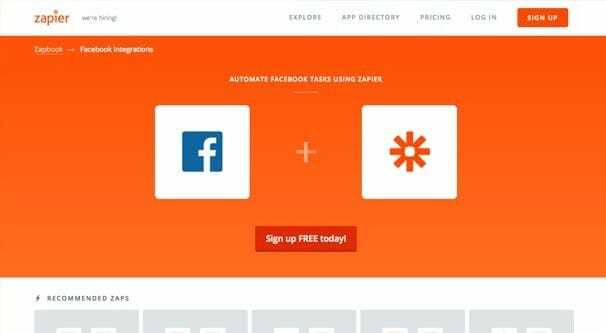 What is Zapier? If you’re here, you probably already know, but I’ll give you the rundown nevertheless. Using an API manually is an arcane process, but programming a script to use an API to perform actions is the foundation on which most social media interaction programs exist. Anything that analyzes Twitter pulls data from the Twitter API to analyze. Anything that posts on Facebook uses the Facebook API to push those posts. Now, you could go create a special program to automate anything you want, but that requires the ability to develop custom programs for everything. You could also look for the features you want in the various social media apps out there, but if you want some disparate features you might end up getting – and paying for – half a dozen tools you aren’t using to their fullest. Enter Zapier. Zapier is effectively an API connection engine. They have endpoints for all sorts of actions that can be taken. Some of them are triggers and some of them are actions. Triggers are things Zapier watches for, like bait in a mouse trap. When a mouse steps on the trap, that’s the trigger. Actions are the item that happens when they’re triggered; the trap snapping shut. The unique part about Zapier is that all of the triggers are over in one pile and all of the actions are over in another, and they fit together like Lego bricks. You pick a trigger, you pick an action, and you create a Zap. What sort of things can be Zaps? Just about anything an API can do. 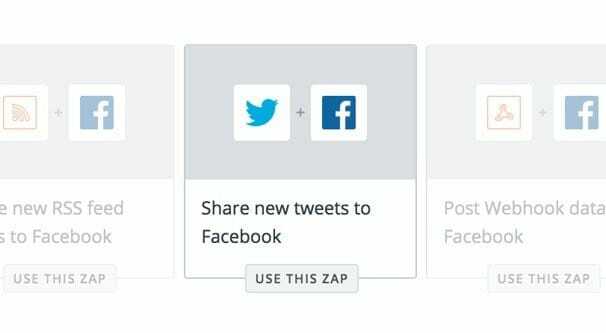 You can set up a Zap so that whenever you like a post on Instagram, a copy of that post is saved to your Dropbox. You can set up a Zap to turn reminders in Evernote into events on your Google Calendar. And, of course, there are all kinds of Facebook tasks you can automate. In fact, that’s what I’m here for; to recommend to you ten different ways you can use Zaps to automate your Facebook presence. One thing you always do when you create a new blog post is share it on your social feeds, right? Well, there are ways to automate that. 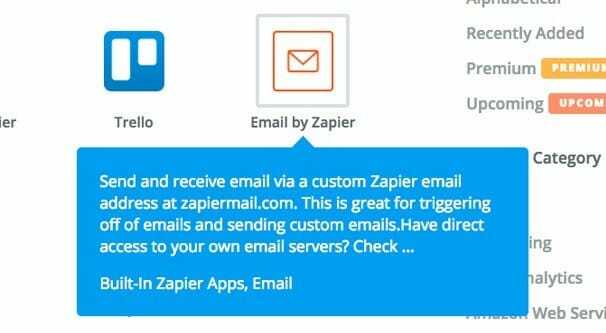 Zapier gives you the flexibility to customize the message that goes along with the post, based on some criteria, and you can set it up to post on as many social networks as you want, so long as they have a Zapier action in the database. Plus, you can do this in at least two ways. You can use the standard RSS trigger, which takes your blog RSS feed – yes, you almost definitely have one, even if you’ve never looked at it – and uses that as the source for the link and information you post. However, if you use WordPress, you can also set up a custom WordPress to Facebook trigger-action set. There are a ton of different apps in the Zapier directory, so it’s possible that another blogging system is in there as well. If you use an unusual architecture, take a look and see if it’s there. It very well might be. 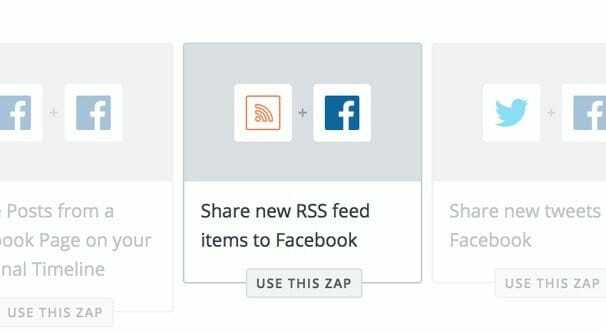 You can set up Zaps to bring posts from your site or your RSS to other social networks, but you can also share posts from Facebook to those other social networks. 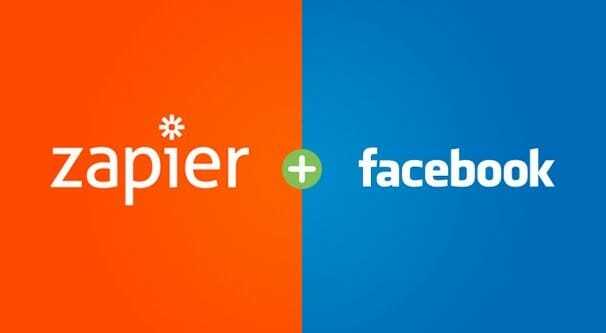 Facebook and Twitter have some basic integration, but Zapier makes it much more robust. In this instance, you will want to use the one Facebook page trigger, which is “when a new post happens”, and add actions for other social networks to it. You can have it share on Twitter, on Instagram, or to LinkedIn. In fact, there are social networks in the list that I’ve never even heard of. Zapier has over 750 apps to browse through, and while some are near-duplicates (Facebook Page, Facebook Ads, etc) there’s a ton of variety. I wouldn’t recommend relying on the Facebook trigger for all of your social media. Rather, use it for some social networks but keep a more hands-on approach to sharing with other networks. If you’re running a mailing list, or several mailing lists, you probably have some kind of contact manager in place. MailChimp, MadMimi, PipeDrive, ActiveCampaign; there are dozens of them, and most of them have apps on Zapier. See where this is going? Step one is to run lead ads on Facebook. You can hook Zapier into these ads using the Facebook leads app and use it as a trigger. The trigger can then monitor when someone clicks and becomes a new lead, automatically adding their contact to your CMS. Once they’re in your CMS, you have options. You can add them to your general mailing list. You can add them to a specific mailing list made up of Facebook leads and send a customized newsletter. You can even set them up for a drip campaign for onboarding that starts only when they’ve clicked, so it’s asynchronous to every other newsletter. 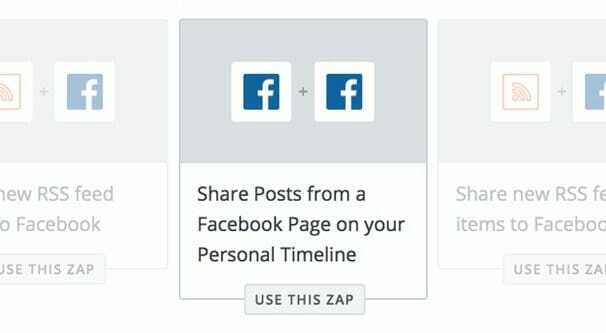 One of the tricks you can do with Zapier is automate in-Facebook actions. For example, you can set up a trigger that happens when your business page publishes a new post. You can then make the action a Facebook action as well. In this case, we’re using the Facebook profile rather than Facebook page app, which allows you to post the content on your personal profile. This can be useful for growing a personal profile, or getting friends and family to take an interest in your brand. Simply set it up to share posts to your personal timeline and see who comes to look. One thing to note is that this triggers off of every new post on your business page. This includes posts you’ve made, but also posts your team has made and posts users have left. If you don’t want all of this shared, you will want to set up a filter for your trigger to only trigger after your posts or your team’s posts. Sometimes, when you have a particularly personable brand, people create Facebook groups revolving around you so they can engage with each other and with you if you’re present. You might even want to set up such a group yourself, so you have a secondary way to communicate on Facebook with your followers, in a more casual setting than can be achieved with a page normally. Zapier includes an app for Facebook groups, and you can do the same thing with it that you did with the personal profile app. Set the trigger for a new page post, and set the action to a post in a group you have the authority to post in. This is best used when you control the group. If you’re not the one controlling it, the admins of the group might not like that you’re posting your own links so much, and they might feel like you’re subverting the purpose of the group. Basically, make sure it’s okay before you set up this kind of automation. Planning events and promoting them on Facebook is nothing new. While Facebook themselves prefer that you use their own event system, you don’t have to, and there are other options to explore. One such option is the Meetup app, which is a hub to help people organize events and gatherings of all sorts. Anything from a pottery class to a marathon to a social movement can be represented there. 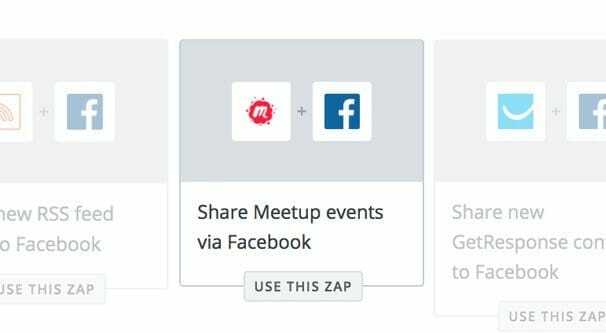 If you want to set up a meeting on Meetup, you can advertise it on Facebook, and you can get that advertising rolling with Zapier. Simply set up and integrate your event on Meetup, then use Zapier to make it post to a Facebook page. When you post the event, and when you post a significant update to the event information, it will update your Facebook page. Unfortunately, there’s no event page management app for Zapier, so you can’t use both of them at the same time with the same kind of automation. When an event is coming up, you can do a little trickery behind the scenes to automatically post to lead-up updates. Remind people the event is coming up and give them links to the details. All you need to do is fill out the information in your Google Calendar. Google Calendar is one of the more robust apps on Zapier, and I could probably fill a list like this of just things you can do with it. In this case, though, simply schedule your events and schedule some reminders leading up to the date of the events. Then set up Zapier so that when the event reminders happen, they are posted to your Facebook page. It’s quick, simple, and effective, even if it’s not the most elegant solution. YouTube is the go-to social network for videos, though Facebook has given them a run for their money in a few metrics. Neither one is going away, which means you have a choice to make. Do you use one or the other? Do you use both, with cross-posting? Do you upload your video to both? While I would normally recommend uploading your video to both YouTube and Facebook, in this case I’m going to cut out Facebook in favor of automation. 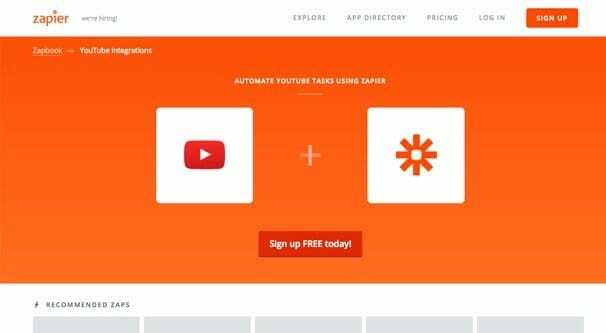 Rather than posting the video directly on the blue giant, you’re going to set up Zapier. The trigger is when a new video is uploaded and published on your YouTube account. The action is posting a link and description of that video to your Facebook feed. This is likely to get you more engagement on your YouTube video, but simultaneously less on your Facebook, since users have to go off-site to see the video. It’s one detriment to using this method, but it should be fine. Facebook has a lot of analytics at its disposal, but one thing that isn’t easy to see is your old posts. You can see things like how often you’ve posted and the engagement each post has gotten, but it’s harder to parse what dates they were posted and what content they contained. In this case, you’re using Facebook posts as the trigger event. When a new post happens on your Facebook page, set Zapier to automatically save it to your Google Calendar. Other calendar apps might be useful as well. What this does is creates a sort of retroactive editorial calendar for your Facebook page. You’ll be able to see post distribution and content all in one place. On a similar note, you can use a new beta app for Facebook Offline Conversations to record data about interactions that have happened outside of Facebook. This centralizes your communications around Facebook, which gives you more analysis and control over them in one location. Whether or not it’s useful to you depends on how much you use that particular Facebook feature. What’s your favorite Facebook-related Zap?